Freeborn is out with yet another single. This time they brought Henrisoul to do justice to the song. According to them “We like what God is doing in our lives because its blowing up our minds and we feel its time for us to tell our fans out there that we don’t have time to play anymore we are in for some serious business. God has given us power to have dominion over everything”. Freeborn is explosive and energetic for GOD They call their kind of music MAD music which means Manifold Anointed Discharge Of Music. (Video + Audio) TIV – What Is The Matter? Produced by A2 (producer of Komole) and mixed by Sheyman, this song is fast-paced, energetic, banging and lyrically on-point. The video was directed by Akin Alabi and shot at a shipping terminal in Lagos. It brings something fresh to the table as it features new and unique dance moves on containers and heavy-duty forklifts by over 20 dancers.The video is colorful, engaging, highly entertaining and is bound to set a new trend of creative dance moves in Africa. This video is more special as it’s been released a day after the award-winning husband and wife duo of Akin & Bunmi Alabi who make up T.I.V, were blessed with a baby boy. Enjoy! By TMOGL  Posted in Music, Video	 Tagged Audio, Is, Matter?, the, TIV, Video, What, What Is The Matter? 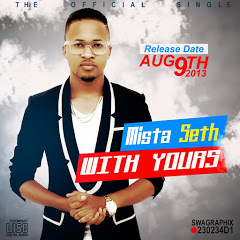 Mista Seth (Retyit Seth Maxwell Dayok) is a talented producer, song writer and vocalist who have brought out the best in artists including Rugged Man, Mode 9, Six foot plus, Terry Da Rap Man, Over Dose (OD), Ricky Bent, Bemser, Samsong, Solomon Lange, Steve williz among many others. His last single Na Ba Ka is topping chats in radio stations across the country. WITH YOURS is his official first single for his yet to be named second albul. its a feel good song and its speaking of Gods greatness in our lives and how we need to allow him to take charge of everything we do.